I photographed a beautiful mama, Hannah Crump, in my home Monday afternoon and cannot be happier with how these photos came out. Hannah is also a wonderful local photographer, we actually met on tumblr years ago when we were both still in High School. Wild how life works. If you haven't noticed, I mostly photograph outdoors, it's just easier for me with the natural light, so working indoors is definitely a struggle. But, thank goodness for photoshop, lightroom, and my rooms natural lighting that these photos were made doable ! We decided to do three different looks and incorporate flowers to have more of a mother nature vibe to this session ! I would like to think that we nailed it. The first few photos are comfortably posed in bed, lounging around, doing what mama's do. 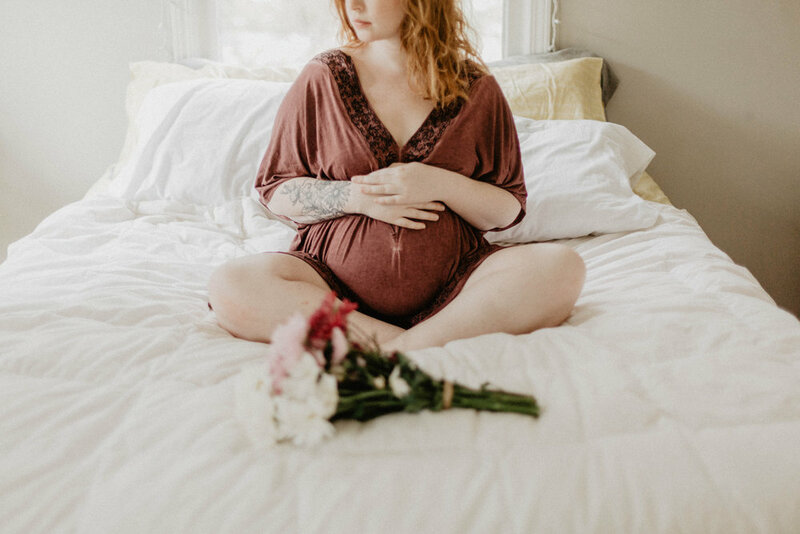 The next few consist of a maternity boudoir in the same location which Hannah was nervous about, but totally came out of her shell and rocked it. The next few photos, we moved to my bathroom where I have a large garden tub. Originally we were going to do a milk bath, but Hannah hates milk ( I don't blame her, because I hate milk also, haha, so I was relived to say the least). We decided instead to use the flowers we've been incorporating into the shoot. Her tattoos peaking out made this session all the more intimate. I focused more on her baby bump in these shots to make them as intimate as possible. I cannot wait to watch Hannah and her little family grow and to see her be the best mother she can be.